Shaun Tuton in action for Buxton against Whitby Town. Morecambe have taken Buxton striker Shaun Tuton on trial. The sought-after Evo-Stik Premier Division front man has 14 goals to his name so far this season and recently spent time training with The Shrimps’ League 2 rivals Carlisle. Tuton has been at the Globe Arena all week and featured in the reserve team’s 2-1 win at Wrexham on Wednesday. 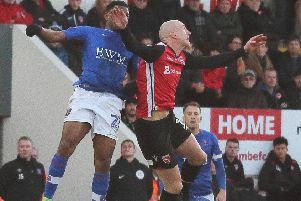 Shrimps boss Jim Bentley said: “He’s attracted quite a lot of interest from the better non-league sides and one or two Football League clubs including ourselves. Shaun Tuton in action against Blyth Spartans.